In his new book, Persuading Congress, Joseph Gibson says that "grassroots efforts have limited utility for most issues," due to the difficulty of mobilizing large numbers of personal responses to members of Congress. Members respond to personal stories but are numb to mass mailings, duplicate emails, or scripted phone call campaigns. Gibson offers an alternative strategy in this excerpt. "Grasstops" refers to getting VIPs to pitch a member of Congress for you. TheCapitol.Net has made this excerpt available for free use. More information about the book, "Persuading Congress," and author Joseph Gibson, follows the excerpt. Thank you. You may not be familiar with the term "grasstops." In the lobbying world, it refers to efforts to influence Congress through contacts with corporate CEOs and other VIPs. In this context, though, VIP is a loose term. For example, if the American Medical Association seeks to persuade Congress of something, the VIPs may be the members' personal doctors. Or a member may have a friend whom the member believes knows more than anyone on the subject. The member may listen to that person and no one else on a particular issue. Like grassroots efforts, grasstops efforts can persuade members and staff. Like most of us, members and staffers like to meet and talk to VIPs. It is part of the fun on the job. But grasstops pressure can also be hard to activate. CEOs are busy people and they do not have time to call members unless the issue matters a lot to the company. If the situation involves personal doctors or friends or something of that sort, it may be difficult to identify who those people are. In most cases, however, the organizations have an easier time applying grasstops pressure than grassroots pressure because organizations control their own leaders. Those leaders will usually know who within their sphere shares their interests and what other prominent leaders may be interested. Basically, you face three issues when you are trying to activate grasstops pressure. Which members are you trying to influence? Whom do they listen to? And within that group of people that those members listen to, who has sufficient interest to make the contact? Once you have thought through those questions, they way forward will usually be fairly clear. If you have decided which VIP should contact which member, then you need to work out the time and place. A personal meeting works best if the timing of the issue allows it and the VIP can get to the member. You can do this in the member's office if that is convenient, but it need not necessarily happen there. It can take place at a social event, a charity dinner, or whatever they two may happen to meet. If time is short or the VIP is across the country, a phone call is the next best option. Most members will make time for a short conversation with a VIP within a day or two. However the contact occurs, the principles discussed in Chapter 35 on meetings apply even more forcefully in this situation. Hone the VIP's message to the bare essentials and get right to the point. Members are busy people and you will waste the opportunity if the VIP spends too much time dawdling over pleasantries. VIPs can have a significant impact on members. Organizations should use them when and where appropriate. JOSEPH GIBSON has worked in the legislative, executive, and judicial branches of the federal government. He has lobbied members of Congress and their staffs, advocated on behalf of the executive branch, and argued cases in federal and state courts. He grew up in Waycross, Georgia, and then attended Yale University, where he received a bachelor's degree in political science. After graduation, he spent a year working as a staffer on the Senate Judiciary Committee. He then went to Yale Law School, where he earned his JD degree. After law school, he clerked for the Hon. R. Lanier Anderson, III, of the United States Court of Appeals for the Eleventh Circuit in Macon, Georgia. He then returned to Washington where he spent the next six and a half years as a litigator with private law firms. Although he was not particularly interested in politics at the time, the Republican takeover of Congress in 1994 led, through a series of connections and circumstances, to his getting a job as an antitrust counsel for the House Judiciary Committee under Chairman Henry Hyde of Illinois. From there, he rose to chief antitrust counsel for the committee. In 2002 he became a deputy assistant attorney general representing the legislative interests of the Department of Justice. In 2003, he returned to the House Judiciary Committee as its chief legislative counsel and parliamentarian under Chairman Jim Sensenbrenner of Wisconsin. After two years there, he became chief of staff to Representative Lamar Smith of Texas. After the 2006 election, he became chief minority counsel of the committee. He has now returned to the private sector where he lobbies on antitrust, intellectual property, and other business issues at the law firm of Constantine Cannon LLC. 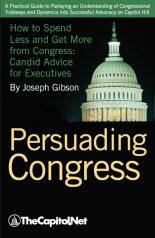 Persuading Congress, by Joseph Gibson, is a very practical book, packed with wisdom and experience in a deceptively short and simple package. What happens in Congress affects all of our lives and extends into every corner of the economy. Because so much is at stake there, businesses and other interest groups spend billions of dollars each year trying to influence legislation. Yet, most of these efforts are doomed to futility from the outset. Only a small percentage of the bills introduced in Congress actually become law, and most interested parties do not fully understand why those few bills succeed. More importantly, how to get Congress to do what they want remains a mystery to them. This book will help you understand Congress. Written from the perspective of one who has helped put a lot of bills on the president's desk and helped stop a lot more, this book explains in everyday terms why Congress behaves as it does. Then it shows you how you can best deploy whatever resources you have to move Congress in your direction. Because you have limited time, this book sticks to the basics and its chapters are short so that it can be digested rapidly. "We are all -- every one of us -- members of several 'special interests.' By providing a practical guide to lobbying, Persuading Congress demystifies the ways in which citizens can influence legislation and achieve their public policy objectives. Anyone who wants to make a difference through legislation -- not just executives -- needs to read this book, master its lessons, and keep it handy." "This revealing book pulls back the curtain on the Congressional decision-making process and, best of all, provides invaluable advice to corporate executives on effectively influencing not just national and local legislation but the corporate environment as well." "In Persuading Congress, Joseph Gibson, a longtime veteran of Capitol Hill, offers masterful counsel to anyone who wants to work well with Congress. In Washington, there are well over 10,000 registered lobbyists. Very few grasp and convey the keys to successful advocacy as well as Gibson does." Copyright ©2010 by TheCapitol.Net. All Rights Reserved. Please feel free to duplicate or distribute this file as long as the excerpt has not been changed and this copyright notice is intact. Thank You!